The tea is not fermented but heated shortly (roasted and steamed) in other words it keeps the green colour and the precious ingredients (minerals, vitamins). The taste ranges from grassy-harsh to aromatically sweet. Leaves are wheeled in small balls. The name “Gunpowder” derives from the infusing process since the leaves seem to explode while infusing. The tea tastes strongly harsh and fresh with a flowery note. The most exported tea – simple, reasonable priced, and it is also available as aromatised types. The Aroma is typically dry and bitter. China’s most favourite tea. In the English language, the tea is called Dragon Well after a legend. The fine and exquisite tea smells sweet and flowery. Actually, the president of China, Mao Zedong (1954-59) served the tea president Nixon when they first met. The tea is mild and tastes lightly without bitterness. The tea is popular during hot summer months since its cooling freshness. The dark green, long and spiral leaves characterize the tea from Taiwan. It smells of mango, therefore the taste is sweet and fruity. The tea has a bloomy mild aroma and offers a diverse flavour. The quality of the tea is not to be scoffed at and it is far too good to drink alongside. A bloomy, slightly sweet tasting green tea speciality that symbolizes richness and beauty. There are jasmines or cloves inside the tea leaves that are sewed to small balls or blossoms. While brewing the blossoms open and create a wonderful picture in the glass. 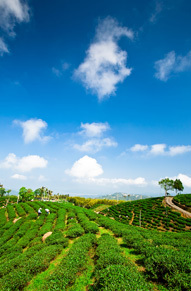 The tea is generally rich in content and “greener” in comparison to other green teas. It is the most popular type of tea in Japan. Sencha means “steamed” since it is the way it is processed after the harvest. The difference in quality ranges from simple to excellent. The high-quality types smell of fresh grass, have a slight bitter taste with a surprising sweetness. The tea is the Japanese everyday tea that contains much calcium and iron. It consists of large and slightly rolled leaves. The name means “Tea of large leaves”. The tea with its refreshing aroma is also enjoyable in the evening because of the low caffeine content. The tea is also called roasted Bancha since it is a variation of the Brancha but slightly roasted reddish brown with a nutty flavour. The taste is quite similar to coffee but it hardly contains caffeine as the two former teas do. The tea is a perfect accompaniment with raw fish such as sushi, and sashimi, and can be served cool, warm or hot. A top class Japanese powder tea that is consumed during Japanese tea ceremonies. The tea can be used for green tea ice cream or sorbet. The aroma is tart and it has a high content of carotene, vitamin A and D.
It is fine and precious tea that is protected with a bamboo mat against sunlight when the first buds sprout. Less bitter substances are produced in the shadow and a fruity aroma with an own sweetness will be unfolded. Due to the first harvest of the tealeaves the soft and mild taste develops.